Author and noted theorist, Luigi Zoja evinces the unsettling argument that the pervasive abuse of drugs in our society can to a large extent be ascribed to the resurgence of a collective need for initiation and initiatory structures. a longing for the sacred underlies our culture's manic drive toward excessive consumption. In a society without ritual the drug addict seeks not so much the thrill of a high as the satisfaction of the inner need for a participation mystique in the dominant religion of our times: consumerism. 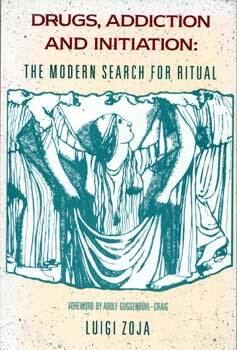 A broad yet incisive cultural analysis, The Search for Ritual is a vigorous study drawing its methodology from history, literature and anthropology as well as analytic psychology. From its critique of drug "cures" based on detoxification to its discussion of the esoteric-terrorist cult of the Assassins, Zoja's work is destined to become a classic in the field of psycho-anthropology. A graduate of the C.G. Jung Institute in Zurich, Luigi Zoja lectures, teaches and maintains an active clinical practice. This book published first in Italian and then German has received much acclaim. Dr. Zoja practices and resides in Milan with his family.